My work is real . . . It is energetic, sometimes figurative, and always about real life. 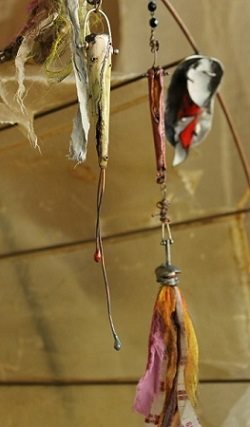 As an artist, silversmith, and inventor of 20-plus years, my body of work tells stories of real people living real life through the use of silver, metal, glass, enamel powders, resin, wood, and other mixed-media materials. These components can be raw in their authenticity, but always beautiful in their uniqueness. Formally trained as an artist and later as a silversmith, it made sense that I was drawn to color on metal. It is how I can make a piece look interesting and expressive using texture, text, color, and form. In my new work, and as I venture back into the process of enameling, I am taking the opportunity to explore two distinct facets of enameling that create an exciting and unique look. The first is putting down layer upon layer of transparent medium and altering with small opaque images, text, or pattern (such as the #4 prong ring, left) to create a somewhat graffiti look. It will give you height, dimension, and negative and positive space. I have a fabulous collection of graffiti images that were painted in cities on walls, trains, buses, etc. I took these photos while traveling over the past few years. They inspire me as I emulate this look on a small scale with my own metalwork. To me, graffiti is the art of real people expressing real work and issues . . . folk art in a sense. I love working on this concept. In addition to layering transparent medium, I'm working on the inclusion of low-fire enamel supplements that can really add a pretty cool distinctive look. Here I may sound more like a painter than a metalsmith, but these enamel supplements include using liquid enamels for sgrafitto and a crackle effect by purposely using incompatible enamel powders, crayons to color, pencils to sketch and write messages, markers, watercolor paints to add another layer of color, and transfer images with inks from iron oxide so the color will not burn out when fired. Does this sound like painting to you? I learned enameling in a traditional sense, using a kiln and building layers. Later, I ventured into torch firing enamels, which creates light work that's easy to burn out and manipulate. In my studio, I use both a torch and a kiln at various times and for different reasons. If I want my work precise and I am building in multiple layers, as mentioned above, I use my kiln. When firing pieces that require lower temperatures and single or limited layers, I use my torch. It is important to know how to fire soft, medium, and hard enamel powders, as well as why and how to use them to the best of their abilities. This knowledge helps you get into more detailed work. 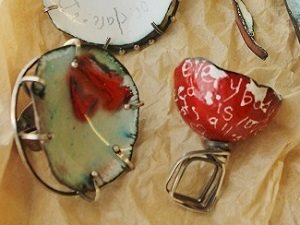 Learn more from Susan: Once you have Susan's enameling video workshop, trust me–you'll want more! 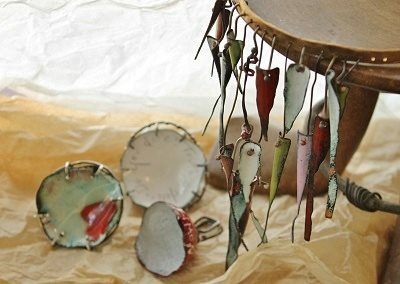 Go deeper into her enameling techniques in her 2014 workshops. Susan will be teaching an all-inclusive five-day retreat in March 2014 in Puerto Vallarta, Mexico, introducing her lucky students to many of her painterly enameling techniques. 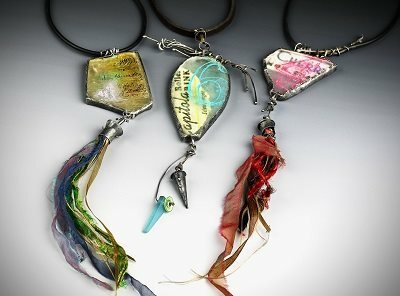 Learn more about Susan, her products, and her workshops at IceResin.com.